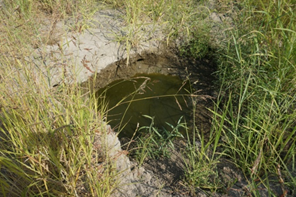 This article briefly reviews our observations since early June in orchards either directly flooded in the river bottoms or those indirectly flooded with standing water for months via under-levee seepage. We’ve written previously on orchard damage in early season and summer updates on orchard flood damage. 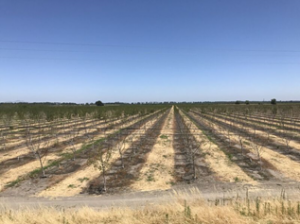 A young Chandler orchard on RX1 clonal Paradox rootstock where a third of the orchard had seepage from January to early May (Photo 1), still had water at a fairly shallow depth in early August (Photo 2). Photo 1. View of young Chandler orchard on RX1 rootstock from the Sacramento River levee on June 29, 2017. Photo: L. Milliron. Photo 2. On August 3rd, 2017, the water level was just under 3 feet deep, but the soil was wet to within 15 inches below the surface from capillary rise. Photo: J. Hasey. 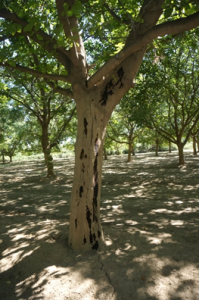 In early August, most Chandler trees in this orchard were still struggling (Photo 3) whereas the rootstock was growing vigorously on trees where spring grafts had failed (Photo 4). We are studying the effects of waterlogging (anoxia) on roots in this orchard. Photo 3. Most Chandler trees had very little new shoot growth in early August. Photo: J. Hasey. Photo 4. 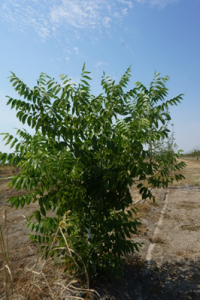 Where grafts had failed, the RX1 clonal Paradox rootstock grew vigorously. Photo: J. Hasey. 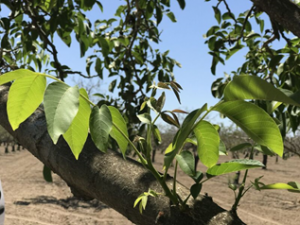 By the end of June and continuing through the summer, walnut trees in several orchards flooded with seepage were producing shoots from adventitious buds (Photo 5). These latent buds normally are “quiescent” yet can “wake up” and sprout when needed from many plant parts (trunks, limbs, or roots). Photo 5. A shoot from an adventitious bud in a Chandler limb on June 29, 2017 in the Meridian Basin. Photo: L. Milliron. Many trees also produced suckers from the rootstock (black, seedling and clonal Paradox) where the English scion was showing some symptoms of waterlogging (sparse shoot growth, small, yellow leaves) to total collapse (Photo 6). Counter to our usual recommendation to remove suckers, we recommended leaving them to produce carbohydrate for root regeneration. Photo 6. Black rootstock suckering in a Chandler orchard flooded for 4 months next to the Feather River levee in Sutter County. Photo: L. Milliron. We identified several Phytophthora species from bleeding root and aerial trunk cankers first noticed around mid-May in river bottoms where walnut trees were partially submerged for prolonged periods. 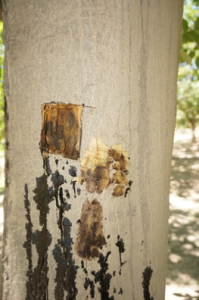 In early August, we sampled aerial cankers from a river bottom orchard where every tree appears to have some infection with minor to severe bleeding symptoms (Photos 7 & 8). Photo 7. Bleeding cankers associated with aerial Phytophthora on river bottom walnut trees on August 8, 2017. Photo: J. Hasey. Photo 8. Bleeding cankers associated with aerial Phytophthora on river bottom walnut trees on August 8, 2017. After bark removal, note the margin between healthy and diseased tissue where the canker is advancing. Photo: J. Hasey. 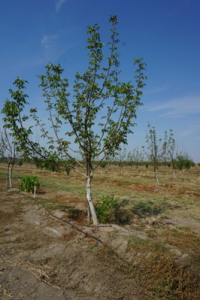 We will be back hoeing affected trees in several orchards at the end of summer to determine effects from waterlogging and/or Phytophthora by examining roots and crowns to look for patterns of root regeneration. Keep in mind there are likely to be effects seen next year and in subsequent years. It is unknown whether trees that regenerated new shoot growth this summer will fully recover. 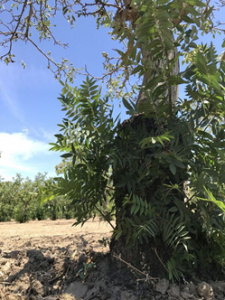 Growers planning to file claims for Farm Service Agency programs who have not had tree losses assessed yet should contact their local office as soon as the loss becomes apparent.